Dark spots disappear with correctors from Yves Rocher, Burt's Bees, Mary Kay and HistoLab and stay gone with Ombrelle! Yves Rocher White Botanical Exceptional Youth Dark Spot Corrector - 14ml - $30 - with a precise applicator tip that perfectly targets dark spots and makes them seem less visible after 1 month while immediately improving texture. Contains white licorice powder for skin brightening and white lupin extract for its anti-aging properties. 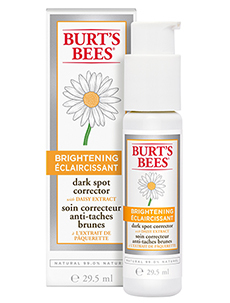 Burt's Bees Brightening Dark Spot Corrector - 30ml - $29.99 - visibly diminishes the appearance of dark spots and evens skin tone to create a brighter, more luminous complexion with daisy extract - which has been shown to be a natural skin brightening agent, combined with a multi-fruit complex including extracts of bilberry, sugar cane, sugar maple, orange and lemon, it makes for a powerful formula with amazing brightening effects! Mary Kay Timewise Even Complexion Dark Spot Reducer - 10ml - $45 - helps reduce the appearance of past damage and dramatically reduces the look of dark spots without lightening the surrounding skin on face, neck, décolleté and hands. It’s gentle enough to use twice a day and absorbs quickly without leaving any tacky after-feel. Formulated with an exclusive MelaCEP Brightening Complex containing four key ingredients: kakadu plum extract – A rich fruit source of vitamin C; helianthus annuus seed extract – a powerful antioxidant derived from sunflowers that is known to help protect against UV damage; ferula foetida extract – known to contain the antioxidant ferulic acid, used in skin-brightening formulas; and lactobacillus ferment – a skin conditioning ingredient. Lightening + Anti-aging + Intensive melanin care + Antioxidant formula packed with botanical ingredients including squalane natural oil for anti-aging and moisture and vitamin E to leave the skin brighter, healthy and radiant. Garnier Ombrelle Face Ultra-Fluid Lotion SPF 60 - 50ml - $16.99 - with an ultra-light, hypoallergenic, fragrance and colourant free formula that won't clog pores and is ideal to wear under makeup. Also available in SPF 30. These sound really effective - I've not used dark spot corrector b before but will have to try!